In December of 1942, the crew of the RAF recon flight 300 is said to have taken a picture of a being of unimaginable proportions, some even called out the image as being one of the best pieces of evidence that giants exist, or existed in the past. However, the truth behind the image is very different from the story many were told. If we look back in history, we will find that countless ancient cultures around the globe believed in the existence of Giants. If we search around a little bit, we will find countless reports, books, and links that point to the possibility that these ‘mythological’ beings were real. Even the Bible suggests these beings may have been real. One of the best pieces of evidence backing up the alleged existence of giants was made in 1988, when one of Europe’s leading newspaper, BILD.de published images of a 38 centimeter long finger. The discovery raised numerous questions and was quickly reported as being fake, even though evidence pointed in another direction. More evidence was supposedly uncovered in Africa. A fascinating, MASSIVE footprint was discovered over a hundred years ago when a hunter called Stoffel Coetzee stumbled across it in 1912 while hunting in the area. The granite block where the footprint is located can be described as ‘phenocrystic’ granite or coarse porphyritic granite which underwent numerous stages of cooling to end up as it is today. Since the discovery, geologists have been left stunned by the gigantic footprint left in ‘rough granite’ of 4 feet in length. It couldn’t have belonged to a giant, right? But there is ample evidence around the globe which offers a lot of material to engage in a debate whether or not there is a possibility that giants once roamed the earth. One of the most interesting pictures I have come across is that of the alleged Great Norwegian Mountain Troll. The being depicted in the image is SUPERMASSIVE. Well take a minute and see the entire story through. Don’t you think that if an RAF recon flight would have actually identified such a being dancing around beneath them, they would not have taken more than just one image? 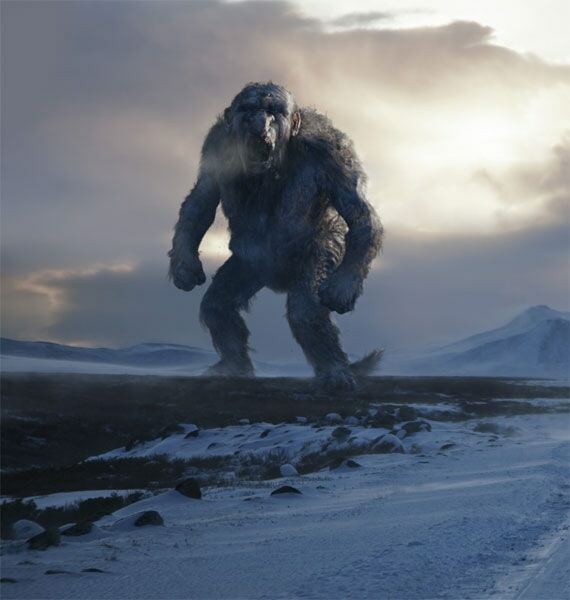 The image which has many people confused and believing giants are real is a screen grab from the movie Troll Hunter. It is perhaps one of the best pieces of evidence how that shows how easy it is to manipulate images creating elaborate hoaxes. In fact, the image which could easily be mistaken for authentic is in fact from the movie Troll Hunter and as junglist313 explains it, the image of the movie and that of the alleged TROLL photographed by a FAR recon flight match up perfectly. While I do believe that there are more mysteries on Earth than we ever thought possible, this image here is not one of them and only proves that in today’s era, creating a hoax is a piece-of-cake.